Ensuring customer privacy is critical to your business and to ours. To protect your customers’ information and assure them your website is secure when they see your ad, Bing Ads strongly recommends you update your URLs to use the HTTPS protocol instead of HTTP. Because of the security and performance benefits associated with its use, HTTPS has become the new standard protocol used on the web (as opposed to the original HTTP). Starting this month, the web browser Google Chrome will begin marking all HTTP pages as “Not secure.” So if your website is still an HTTP URL instead of HTTPS, Chrome users who click on your ads will see your URL marked as “Not secure” in the address bar. How do I check if my site supports HTTPS? If you see a green lock icon to the left of the URL, then your site supports HTTPS (for Edge, this lock may be transparent instead of green). If the lock does not appear, try re-entering your website URL with “https://” instead of “http://”. If the page doesn’t load, then your site does not support HTTPS. The bulk uploads feature within Bing Ads (best for smaller accounts). 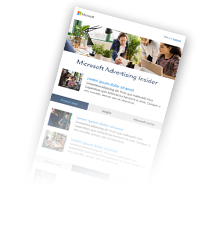 For this option, download your ads and (if necessary) keywords from Bing Ads, update your URLs, and then upload your edited ads back into your Bing Ads account. Learn more about making changes with bulk uploads. Your ads, keywords, and extensions will not go through an editorial review if you are only changing the protocol of their URLs from HTTP to HTTPS. Speak with your webmaster or the administrator of your CMS platform. Then, follow the steps in the previous section, “If your site supports HTTPS,” to change your final URLs and mobile final URLs in Bing Ads. Note that we recommend you redirect instances of HTTP to HTTPS to make sure old links keep working and visitors to your website are redirected to secure content. Feel free to reach us on Twitter. You can also submit your ideas for how to improve this feature and Bing Ads in our feature suggestion forum.